My second full day in Reykjavik was just as amazing as the first one! I got a better night sleep than I did the night before, thanks to the towel I put over my eyes to keep the light out. Since it’s summer, the last light in Iceland is at 11:18 p.m. and the first light is at 3:45 a.m. Pretty cool but not when I forgot my sleeping mask at home and my brain’s trying to play tricks on me. I kicked off the day with an 1.5 hour puffin tour by Reykjavik by Boat (highly recommend them!). 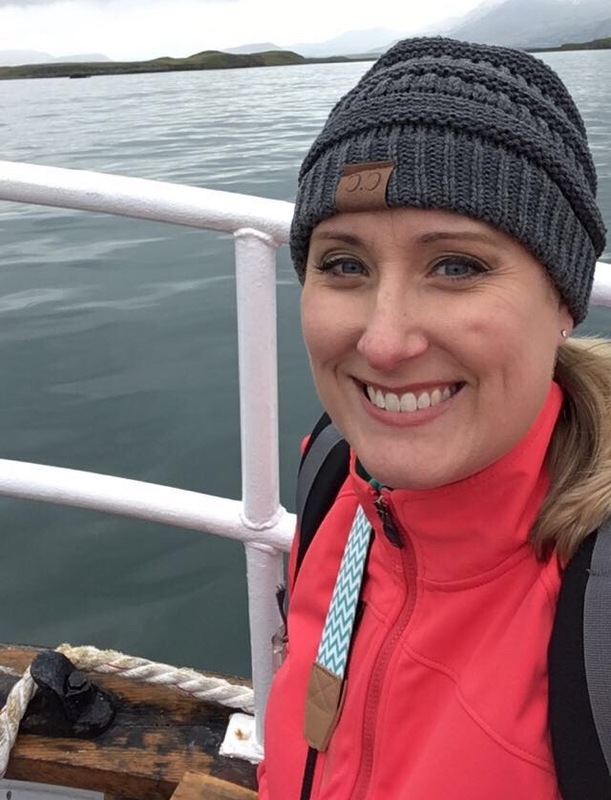 We took a traditional wooden Icelandic fishing boat all around the harbor and out to the see the puffin colonies and some other sites of interest. With temps only around 50 degrees today (Fahrenheit), I’m glad I had on three layers plus my toboggan hat— it was a chilly ride! Light beams appears every year and is visible from October 9th (John’s birthday) until December 8th (the anniversary of his death). The words “Imagine Peace” carved into it in 24 languages on the panels. Site of the historic 1986 summit meeting between Ronald Reagan and Mikhail Gorbachev. Do I look cold? I’ll take this over Buffalo winters any day! Then, it was time to warm up over some Icelandic fish and chips with a side of jalapeño/garlic sauce. Whoa, were they delicious! The Reykjavik Art Museum was right nearby so I stopped in. They mostly had very modern works of art but I was surprised how small it was to be in a national capital. Maybe Toronto’s museums had me a bit jaded but I was lukewarm on this find. Afterwards, I stopped by a grocery store chain called Bonus and tried to find some snack foods for the rest of the trip. I always love seeing grocery stores in other places and how they differ from ours in the U.S. This one was about the size of a CVS and one noticeable difference was the size of their produce. Their veggies, fruits, etc. we’re soooo tiny all except for the sweet potatoes, which were the largest I had ever seen in my life! Weird. Came across this bag of Doritos too. I assume they’re Cool Ranch but Cool American Flavour will have to do! As I was wandering through downtown, I noticed another museum near the end of Reykjavik’s main street, Laugavegur. This particular place was the only one of its kind in the world. THE ONLY ONE IN THE WORLD! And the subject? C’mon, I had to (educational, right?) I was looking for really random and different things to see and damn if I didn’t find it. The Icelandic Phallological Museum was PACKED so I definitely wasn’t the only one who was intrigued. The funniest part was seeing all of the women giggling and some men cringing at the site of animal “specimens” in a jar. Hysterical! Ok, so one of the Icelandic delicacies that I’ve read all about is Kæstur hákarl (or fermented shark). I was determined to at least try it so I found a spot, Cafe Loki, that offered very small tasting portions. So I ordered it, along with smoked trout (another delicacy) on their homemade rye bread and an Einstök Toasted Porter. I started on the trout and beer first, knowing that this experience wasn’t going to go well. The trout tasted a lot like smoked salmon so I thought it was delish. And then the rotten shark went down the hatch. It didn’t taste too bad at first — just like a light sushi. But then, the aftertaste. I just ate a piece of shark that tastes like nail polish removed. Blllaaaah! 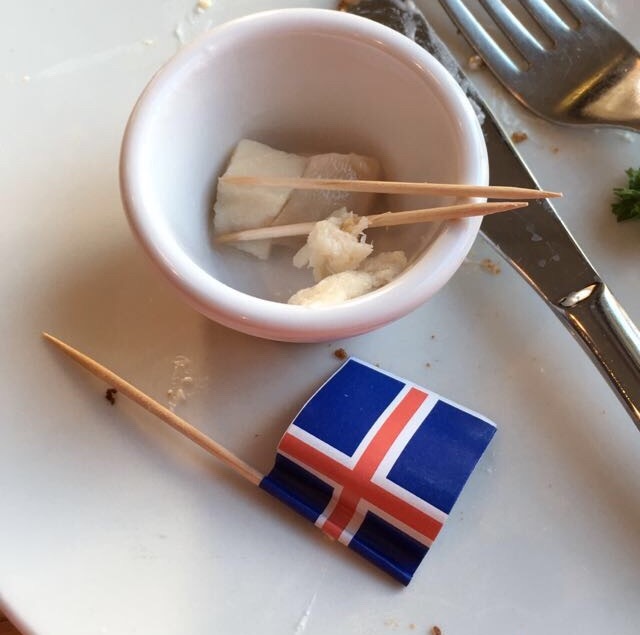 They even tried to make it all cutesy with the Icelandic flag toothpick (damn marketers). So there you have it. I said I’d try it and I did. But never again. I thought I wouldn’t walk nearly as much as I did yesterday but ended up pretty close. According to my Apple Health app, I’ve logged over 19 miles over the last two days. I love it that Reykjavik is a really walkable city with everything within a 10–15 walk. Tomorrow, I visit Iceland’s Golden Circle and go snorkeling in the Silfra Fissure — a crack dividing the North American and the Eurasian tectonic plates.